In my last post, I compared web marketing without content to fishing without bait. Everyone would agree that fishing without bait is not very smart. Everyone SHOULD agree that web marketing without content is not very smart.Let's assume that we can all agree that we need content to make web marketing effective. People always ask, what should we be posting in social media? I always ask if they have a blog. 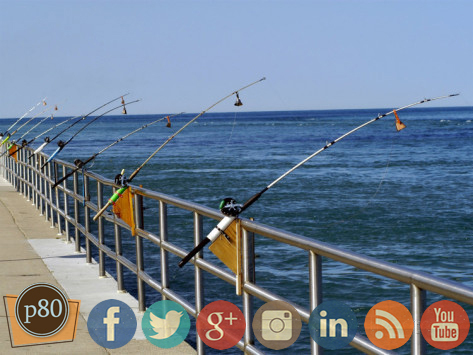 If you DO have a blog, think of your posts as the bait and your social media updates as fishing poles. That's right! Social media means you can be fishing in multiple bodies of water at a time, with multiple poles!! How great is that?? Pretty freakin great! Having more lines in the water means you are greatly improving your chances of catching a fish. Not to mention, that bait, your blog post is being used in many ways, meaning you are getting much more out of your time investment! That's always good news! You know that dream you have of catching that monster walleye? You can totally do that with your blog posts, social media and tool called Buffer. I won't do a deep dive on Buffer today, but it is essentially a FREE tool that lets you share content through social media and get analytics on how effective it is. You can also schedule your social media updates, so you can write a blog post and schedule it to be shared multiple times, even while you sleep. Pretty nice!